Obviously I'm being overdramatic here, and to tell you the truth, it really is not that bad. However, it is definitely controversial. Some have praised it to be the best in the series, while others can't stand touching the game ever again if it means they'd have to suffer through another millisecond of cycling through decks and compile sleights. Most can agree that having to do that with both the left and right index finger hovering protectively over the shoulder buttons, scrolling through all those cards and trying to remember where exactly you put those level 0's to break Riku Replica's infamous Dark Aura is an absolute huge waste of time. For some reason, the simple solution of better deck management is just simply not an option. The player isn't the problem, the battle system is, and something must be done about it. What most people are unaware of is that something has been done about it, and that something has been eagerly embraced by many as the only system this series can ever use, and the only one it should ever use. Lets face it: once you go command deck, it's hard to go back to anything at all. Let's start with KH. Exactly what does it take for a game to be "Kingdom Hearts"? Certainly the story and characters, the worlds, all the things that fill up the universe within it. But it's not just that. It's the battle system as well. Kingdom Hearts's battle system, according to Director Nomura, is meant to convey the feeling of pure invigoration and glee, where the player can feel the strength of their avatar within the world rushing through their body and feeling that sense of bliss and satisfaction. It's where you can realize that, hey, you're really cool! Look at all the incredibly things you can accomplish, regardless of the shape or form it comes in. The command deck system, making its debut in the 2010 installment KINGDOM HEARTS Birth by Sleep, is an evolved form of the card system previously utilized in Chain of Memories. Shocker right? Who would have ever thought something "good" could come out of those despicable cards? To tell you the truth, many individuals, particularly those in the development team over in Osaka. The transformation from the original KINGDOM HEARTS to KINGDOM HEARTS II alone should have been a huge giveaway: this series isn't done evolving yet! As the characters grow and the story expands, it'd be impossible to retain the same gameplay system all the way through. Well, not impossible, but perhaps a better way to say it would be "unplayable." How many of us have picked up a Playstation 2 controller after completing Birth by Sleep or even the latest KINGDOM HEARTS 3D [Dream Drop Distance], and downright struggled getting through the game? "Those menus are nice, but what I'd really like to do is to whip out my trusty Balloonga to devastate the battle field! When will I be able to do that in these games?" In my dreams apparently (no pun intended), because we're stuck with the basic melee attacks and magic with that glorious MP bar, which I'm sure we're all just dying to see again! We're not done yet though. Of course the jump from Chain of Memories to Birth by Sleep is far too great to accomplish with just that. Surely there must be other sources of inspiration that went into making the command deck the fan favorite in the series? You're absolutely right. There was one other title whose gameplay provided a great influence in the creation of this system, and that is the Nintendo DS cult classic THE WORLD ENDS WITH YOU. Let that sink in for a while. Abandon all thoughts of dressing the Players up in ridiculous outfits from Lapin Angelique and Natural Puppy, and just concentrate on the battle. Focus on the pins. They are to The World Ends With You what commands are to Birth by Sleep. The player can customize Pin decks, a maximum of 6 assuming you've gathered the necessary stickers to unlock the extra slots, each with a unique special ability, design and cooldown timer. With points accumulated through battle and various other means, you can level up your pins to increase their strength. Carried over to Birth by Sleep, we have commands, command decks, experience points, cooldowns, and all those zany and ridiculously overpowered attacks we know and love. If only they also adopted other aspects from the DS title! Even though I said previously to abandon all thoughts about this subject, I personally would love if there actually were other outfits for our three protagonists! At least then they wouldn't stick out like a sore thumb in every world! But that's neither here nor there so pipe dreams must remain pipe dreams. One thing's for sure, the command deck system is here to stay. No matter where it originated from, it's evolved, been influenced and grown far beyond our expectations. The one thing left to do is see just how far it can possibly go. The only question is, do you want to come along for the ride? Am I the only one that had no problem with the card system in Re: CoM? I think it's better than the hack/slash that resonated in the first two games. You actually had to think about your attack for once. I had to warm up to the card system. At first, I hated everything about it ;however, now I like it some. It's not my favorite-that would be the command deck system-but I thought it was pretty creative. I do kind of miss the MP bar from the PS2 games. 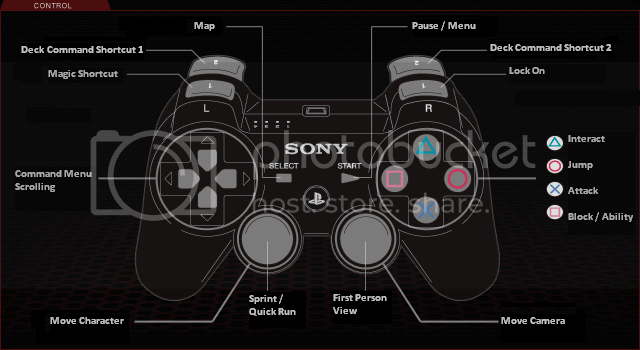 Maybe they could incorporate 2 different shortcut menus, with one of them holding some attack commands introduced in BBS/3D that are powered by the MP bar, while the other is just standard shortcuts. Great article! This will definitely help more people appreciate CoM's battle system. I really loved CoM's card combat, though I may be biased since that was the game that got me into KH. It was just much more strategic than any game before or after it. The command system is undeniably more fun, but I will always have a soft spot in my heart for my trusty card deck. Still, I hope future games stick to variations of the command deck. I'm actually hoping that in a future game they try to mix the command deck and the ability grid from Days. It seems like Days' mechanical contributions are always forgotten/ignored. Having all your commands, abilities, and stat-boosters on one grid would result in some seriously awesome strategic thought. You could load your grid with 15 crazy commands but sacrifice all your stat increases and abilities, or you could trade only having one or two good commands for over-the-top stats and abilities. Or you could obviously stand in the middle ground. It would allow you to customize a lot for certain levels/bosses. Don't need glide for this boss? Toss it and add an extra curaga to your deck. Grinding for items in a low-level area? Drop your defense and HP and add more screen-clearing commands. I've thought about this a lot. Overall, I am equally as interested in how KH3's battle system will be like, as I am in the actual story that will be presented in KH3. I really like the traditional style KH gameplay (KH1, KH2) but I also like the command deck style as well (BBS, DDD). Personally, I feel that a mix of the two is the best option for KH3, combining the ability and combo based attacking of KH2, with the command deck of BBS. I figure that the best way to do this would be to have a very similar command menu as KH2. The Limit selection could be replaced with a Deck selection that brought up a list of up to 8 Deck Commands that you equip similar to the way it works in BBS. Magic (like Fire, Blizzard, ect.) would still be located in the Magic menu and would cost MP. Deck commands would have a reload timer. Just like how Magic has its own shortcut (with L1), Deck commands would have 2 Shortcuts to have quick access to the entire deck (with L2 and R2). Drives should be brought back as well, as I think that they added an interesting, and fun game element. 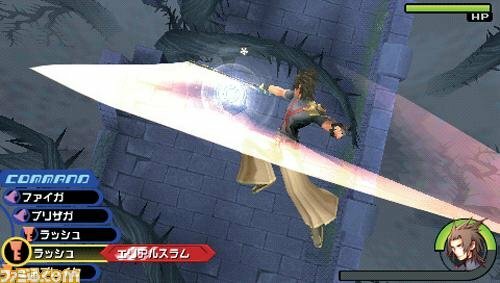 The standard combo attacks in the game would be like the way they are in KH2, where you equip abilities to modify the combo with additional hits, long ranged attacks, ground-to-air attacks, special finishing moves, ect. This way of mixing gameplay styles (or another similar way) is, in my opinion, the best way to take the series' gameplay to the next step. It also has the additional bonus of satisfying both the long-time fans of the series who may prefer the old style of combat, as well as the newcomers to the franchise who may be more comfortable with the command deck style. At first I couldn't stand the card system, I thought it was so annoying for no reason whatsoever. I just hated how you had to combine all the cards to get special attacks (I could never remember the combinations for that XD) and having to quickly go through your deck to get a high enough card to actually attack. I didn't hate the system enough that I would stop playing the game though. Now, I think I'm starting to warm up to the card system. Although I haven't played COM in a years, I did become a little obsessed with Flick Rush in KH3D which uses almost the exact same battle system. To be honest, if the deck command system had the shortcut feature, I'd be even happier. Keep me from scrolling like crazy to find cure, potion, or a specific ability. Oh boy, the card system... I don't understand the purpose of this, the command deck is what the card system in CoM (story-wise) was supposed to be. Honestly, I enjoyed the card system to an extent (I was pretty good at it after all) but I would prefer it continue as a piece of kingdom hearts history and that we never have to see it again. I remember when I first played through the card system I hated it with all my guts. The reason being is that my child mind with that gba did not grasp the whole lose a card with a combo. So it literally took me 2.5 hours to defeat axel with only a 4 cure and a 8 kingdom key. But when I understood the system a little better I had some fun with it. But I would prefer the KH1/2 system in 3. 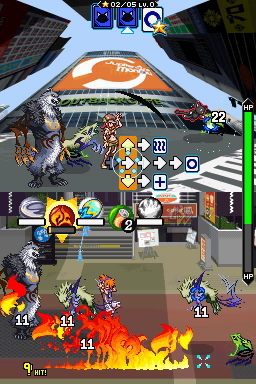 Although it may sound like just howling with the wolves by now I've also to say that this is a very well done article, especially with the spin towards TWEWY and the clear showing of the step from the "experimental" card system in CoM (probably the best that could be done with the GBA at the time) to the more refined experience of BBS. That said, like you say in the last paragraph, the command deck is there to stay. It's by far the most advanced system the KH series has and it surely can be tweaked a bit further to make it even better. I like the notion of, say, having twelve (or thirteen, for symbolism, lol) slots maximum instead of eight and in exchange for that get four shortcuts instead of one like BBS and DDD had like in KH1 and 2. I'm certainly along for the ride as I personally see no need to ever get back to the tedious system that KH 1 and 2 had except Nostalgia-vibes because gameplay-wise it would be a huge step backwards. It was just simple hack'n slash not needing any management with Magic borderline useless. The menu-style stuff is good for turn-based battle but not the fast-paced style KH wants to present. For me I always appreciated the challenge Chain of Memories provided with the card deck system. While I was hardly the most intelligent child in the early 2000s, the need to think of strategies when facing certain kinds of Heartless and bosses was always extremely thrilling even if did I hid CoM and my GBA away for an entire year because Replica Riku kept brutally murdering me during our second encounter. It was fun and not about mashing one button to kill enemies. You had to think and be able to adapt, even accept that you must die a few times before you figure out the right combination of sleights to kill a hard boss. KH2 was such a drastic change from CoM that, while I enjoyed it during my first playthrough, I only needed to rely on brute force and mashing X (and sometimes triangle and a good dodge or Reflect spam) to make it through a boss fight. I couldn't help but think something was missing from the entire experience, and that was the ability to strategize. BBS was a breath of fresh air after KH2 because it was a return to a system that required a bit of thinking to use. Of course, BBS was slightly broken in that you could merge commands early on to get the best ones and just power through everything without much effort. Despite that there was still a level of challenge not present in KH2 that gave me a bigger sense of fulfillment I had missed from my KH1/CoM days. TWEWY's entire gameplay system has to be my favorite thing in the world so knowing it was the inspiration for BBS, Re:coded, and KH3D's system always gives me this satisfied feeling. Anyways, Re:coded and KH3D only improved on the idea of commands so if it is in KH3 I would have no complaints. I feel like we've moved on from KH1 and KH2's battle system considering how irrelevant it is when we have the superior commands. Nostalgia can only get a game so far and I'd rather have a strong gameplay system that can continue to evolve and present a bit of challenge than the system that only takes furiously mashing one button to do anything. All I hope for is that in KH3, they put in the reaction commands from KH2, those were so fun to utilise. I find the command deck at times to be quite overpowered simply because I rely on it too much to kill a whole group of enemies but overall I enjoy the battle system. You know, I really think days has a place in here. The panel system and command menu were pretty evolved at that point.